Venice is not only canals, and not only tourists. 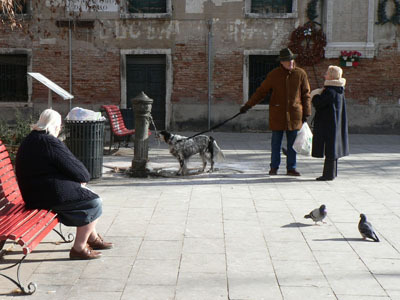 On a small square, the locals enjoy the warming sun on a chilly January day. 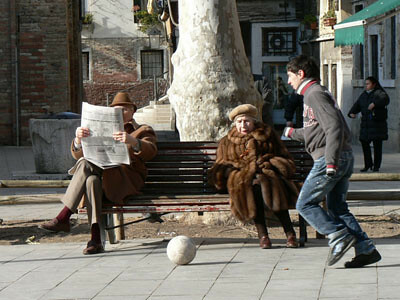 This entry was written by Olga Schlyter , posted on Saturday September 30 2006at 04:09 pm , filed under Europe and tagged Italy, Streetlife, Venice, Winter . Bookmark the permalink . Post a comment below or leave a trackback: Trackback URL. Those water fountains (the dog is drinking from one in your first photo) must be common in all Italian cities. In Rome they were abundant and people would stop to drink from them — if you plugged the spout a small stream of water would spray upwards into your mouth. Both more practical and more hygenic than North American drinking fountains. Many of the small squares in Venice are in fact laid out above fresh water reservoirs. In the old times, fountains like these were where the venetians got all their water.